How often have you felt,’if only I could get ___[fill it up with whatever you fancy] RIGHT NOW? ?Oh..I always do.I fancy eating cupcakes from Best Bakery,Pink Cake from Society bakery and very often,Chocolate sip-ups from Punchiris[a shop near my College in Ekm].sadly,most of the times,I satisfy my cravings by eating something closest to it.I don’t have a choice,do I? Few days back,while watching Rachel Allen’s show on Travel and Living,I saw her making Tarts.I remembered the yummy Jam-filled and Chocolate filled tarts from Best bakery which my bro used to bring home for me.Even if he didn’t *giggle*,I could just get out of my house,cross the road and get it myself,yup it was bang opposite our place.I had not had them for the longest time and I was literally craving for it.Maybe I should just stop watching those food shows on Tv. I remembered Ria had posted them a while back.I didn’t waste a moment and set out making it.The recipe is a winner,a simple one which even a beginner can make.I was one-it was the first time I was making tarts and I was a bit apprehensive.But the recipe worked like magic and I was satisfied only after I gobbled down 3 of those in one go..YES!! Now add water little by little and form a dough[do not knead,just mix slightly with your fingertips]. Divide the dough into 12 parts.Flatten each ball using a rolling pin and line the tart moulds. Fill 2/3 of the tart with jam. 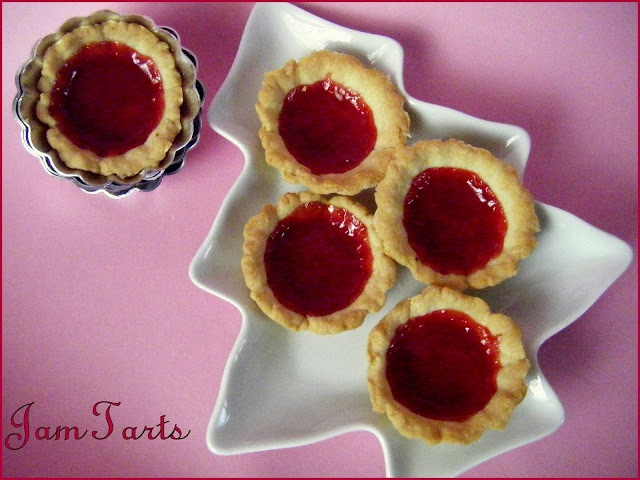 Tarts look lovely and delicious! Tarts look very flaky and buttery. Good presentation. Soooooo cute and delicious...Great effort dear. your baking skills are improving day by day Divya,I am truly impressed,the tarts look COOL in ur beautiful platter. I love jam tarts and this just looks so so super delicous. yummm...going to try this soon !! !..commenting here for the first time ..have tried a couple of u r cake/cup cake recipies.. lovely blog !! looks sooo good and nice click too..an award waiting for u on my blog..plz collect it..
Love the plate and jam filles tart beautifully presented! Yummy Tarts !!! They are just what the Docter ordered ! pretty tarts Divya! must have tasted wonderful too. looks yum!! These look neat and pretty. Just like from a bakeshop. This is my first visit here. Great job! lovely..have made these a longlong time back...they look great my kids will love them..
oh these were such a favourite as kid! glad u put up this recipe..brings back happy memories! just perfect! can't wait to try it out...I was wondering if we could do in Muffin pan? 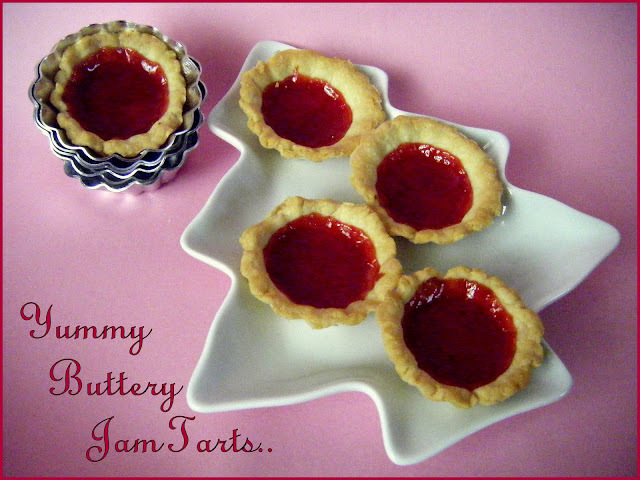 tried the jam tarts.they turned out just lovely!exellent recipe.simple and great! 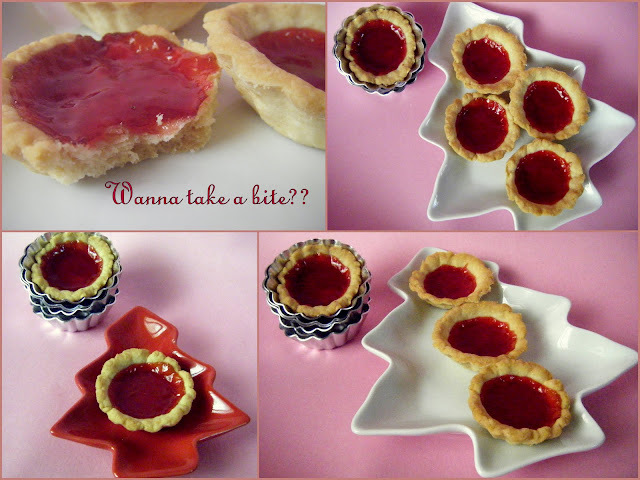 excellent recipe!tried it and the tarts turned out superb! Hey. can i do this in microwave? what power and how much time is required?